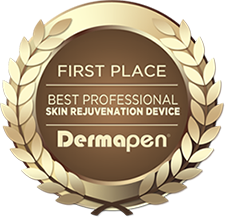 ND Skin Clinic Prestwich » Dermapen..
At ND Beauty Skin Clinic we use the original Dermapen 3™ fractional rejuvenation device which is widely recognised as the Gold Standard in micro-needling technology. It will enchance penetration of any ingredient with 200 times more delivery, dramatically giving value and additional results to any skin care regime. Advanced skin micro-needling, a procedure that stimulates the natural protection of collagen to regenerate and repair the skin naturally and safely, creates smoother, brighter, healthier, younger looking skin. We have numerous methods today to tighten skin, such as laser resurfacing and deep peeling, These treatments can damage the epidermis, making it thinner than before; skin becomes more sensitive to photodamage. Many client now demand less abrasive and invasive skin treatments. We believe the CST available at ND Beauty Skin Clinic can give our clients real results. Dramatic improvements without the need for invasive surgery. Before your procedure a topical anaesthetic is applied to your skin for comfort. Next, your skincare professional uses a small instrument containing tiny needles to create thousands of microscopic channels in the lower level of your skin. This stimulates new collagen deposition which may last for up to a year. Immediately after your procedure your skin may look as though you have moderate sunburn and may feel warm and tighter than usual. This will start to subside after 2 hours and will usually recover on the same day. These treatments can be done on the face or body and are suitable for all skin types. It’s recommended that clients undergo 3-6 sessions of Dermapen or Collagen Stimulation Therapy over 6 to 18 weeks.